I was looking at different ways in which we can version the OSB services for my customer. It is a dilemma for all when you get requests for OSB changes due to system standardization like change in the proxy URLS to meet new standards/new functionalities where signatures will change of the exposed services. This issue can arise in any enterprise because when you start of initially without properly architecting the SOA services, not laying down proper standards and guidelines and. Going forward, there will be huge increase in services and how to manage all these services and consumers of these services will be always painstaking. 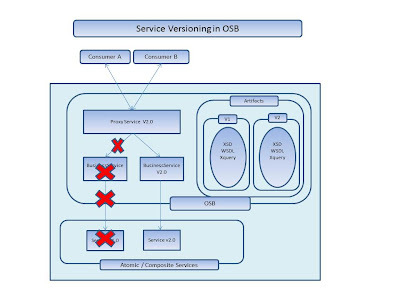 In this article I will put down some points on the service versioning that can be done in OSB. 2. Adding new operations to an existing/new port type in WSDL document. These are basically new functionalities so will not affect existing consumers. 1. Altering/Removing an operation that is currently consumed. 1. Namespaces - Unique namespaces to define the new version, usually implemented by mentioning version number. 2. Folder structure - Separate folders for storing artifacts and folder name mentioning version. If the consumer need not be affected and if the new service is not backward compatible, then its always better to maintain different versions of proxy service and have new consumers consume the new Version. When the old consumer is ready to upgrade and move to new version we can deprecate the v1.0 and shutdown the proxy service. I prefer the Option 2 it’s more easy and clean and doesn’t affect existing consumers. Option1 and Option3 are quite similar except that in Option3 the consumer is affected due to the endpoint change and consumer is aware about the version of the Service it’s consuming. In Option 2, Consumer 2 has to change the endpoint because it now has to point to proxy 2, So I believe it needs code change at consumer end as well.